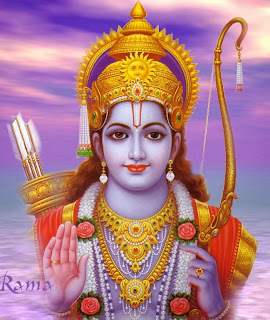 I don’t know how Lord Ram looked when he was born or even before I was born, but let us see how he has evolved in his depiction over the last 6 decades or so. This evolution of Ram is not just due to changing ‘tastes’ and/or perceptions of the new generation, but this could also be seen as the political evolution of Ram for the sake of some select few who have become the owners of this new Ram. However, the metamorphosis is interesting and speaks volumes of his worshipers and the society at large, who have accepted these changes. The above picture is a painting by Raja Ravi Varma (1848 – 1906) who was the first to put faces to our mythological heroes. 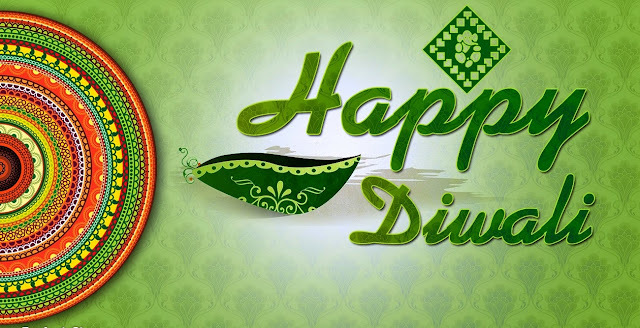 In this picture, Ram is seen as a true ‘vanvasi’ and does not look the bedecked hero that we know him as. Though Ram is seen striking an aggressive pose, since he is trying to shoot an arrow to calm the raging sea and Varuna trying to pacify him, he is not the warrior god as yet. If seen in context, this is a picture from the ‘yudh-kanda’, i.e. the war-phase, so this is not entirely out of context. 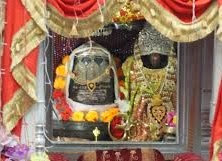 The one above is the picture from around the 50’s where Ram is shown as a gentle and a quiet god, with his palm raised to bless. Though he is shown carrying the bow and arrow, it does not dominate the picture. 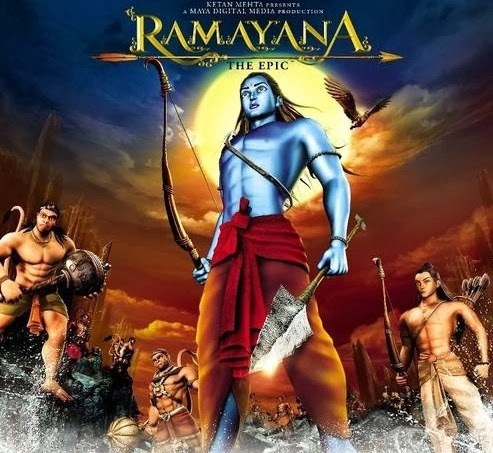 The bow and arrow could be seen as a pictorial reference of Rama being a Kshatriya, and probably nothing beyond. The action of the usage of the weapon is missing. His slight smile and a mild demeanour depict his genteel nature that is in the minds of many for long. Nowhere does it betray the image that would be coming up during the next few decades. The picture above is from early 70’s which is much the same as far as the facial expressions are concerned, but the posture has undergone a change. Ram is now gaining an aggressive posture with the bow and arrow coming in prominence. The background of raging seas and burning sky adds to the spirit of aggression that is being depicted. But let’s not lose sight of the fact that the face is still smiling non-aggressive. This one above is an image of early 90’s and undeniably a complete transformation from the erstwhile image of Ram. 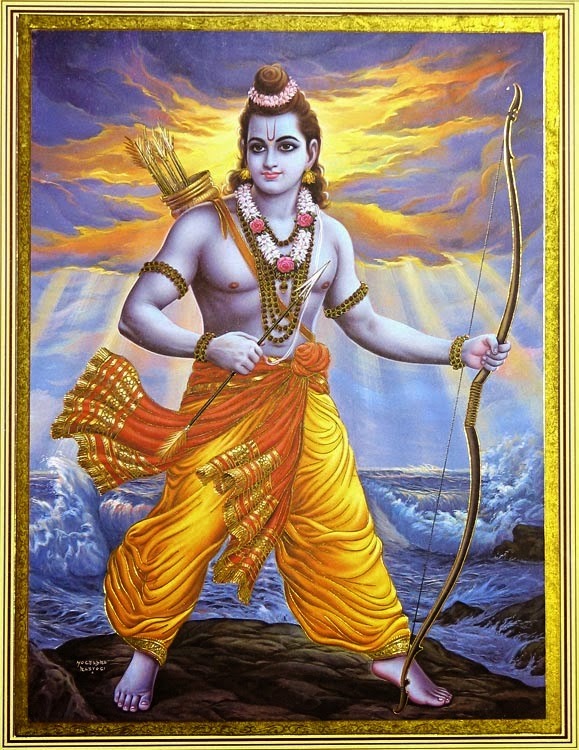 Here Ram is the warrior god and out to avenge all that his followers claim to be. This is the picture that was pasted all over the country by a certain organisation that seemed to champion the cause of the majority. Ram here is an aggressive god and has lost the genteel image that he had for so long. The hand raised in blessing is completely missing and his physique is more muscular and warrior-like. The adornments are all gone and all you see are signs of a warrior out to wage a war. Finally the latest! The above picture is from a much forgettable animation film made in the year 2010. In this we see Ram as a modern day warrior god all with six-pack abs and in a form never seen before. The weapons though the same, the arrow has undergone a transformation along with the looks of Lakshman and Hanuman. They look more Nordic in their forms and any signs of benevolence, etc. so associated with Ram till a few decades back are completely missing. The well chiseled face, the biceps, the abs and the flowing locks all with a background of destruction (with the eagle thrown in), and the massive arrow is straight out of a Viking inspired war game. Times change and so do our tastes, just as our needs and wants. In the case of Ram, this seems to be no different. 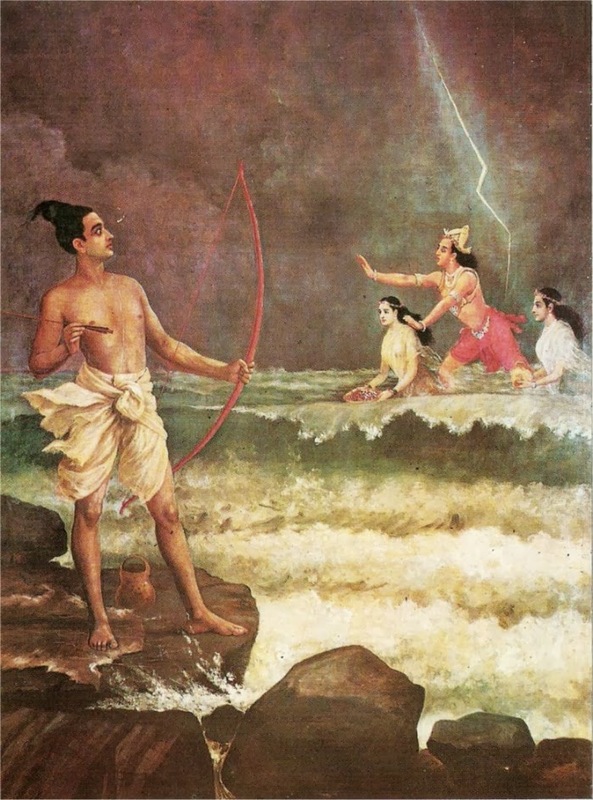 Raja Ravi Varma’s depiction was more for us to have an idea of what gods could be like. They resembled more like us as we were, simple and not necessarily shapely. 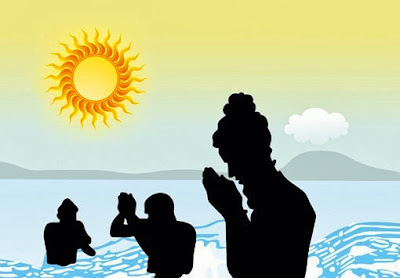 Then came the calendar art, which ensured that the gods be seen in all the splendour and finery that make then different from our mortal selves. The halo, the ornamentation, the silk finery and the heavenly looks that made them worthy of worship, were added. Thereafter some gods became subjects of politics and we started making them accordingly. 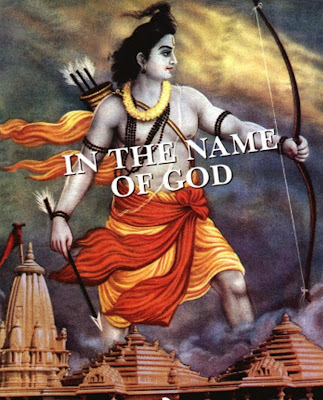 A subtle god like Ram became aggressive and his hands that were always raised to bless now took up weapons to avenge, what his worshipers wanted him to. Suddenly Ram became owned by a few who decided how he would look and what he would imply by the looks. Even before this could be resolved, some people decided to give him a makeover. To make him more acceptable, he was given a new look, yet again. 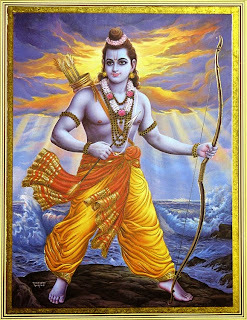 Ram now was a complete modern man, all with the six-pack abs and the biceps and triceps which gives a feeling that the jungle where he spent for his exile must be having a gym with all the modern equipments! A recent blog has come up with the interpretation of a young artist, which takes Ram (and other deities) in the genre of sci-fi. In this Ram is depicted as a fierce warrior, clad in flowing animal-skin attire, shooting multiple arrows. He is sitting atop a flying, white-furred Hanuman with angry looks. Needless to say, that all the other depictions too are a major flight of fancy, which has caught the fancy of the new generation! I have only traced the evolution of Ram from Raja Ravi Varma to now. I am not sure where and when will this stop; before man’s flights of fancy makes him do more harm than what has been done already. 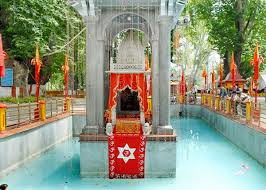 Read about the myths and other legends associated with this unique temple in Kashmir.